"Herrmann was a noted heldenbariton with a big, bright, and somewhat metallic voice that was powerful up to high A, and a dramatic temperament that made for intense, committed characterizations." “Ferenc Fricsay's career lasted barely 20 years, but during that time, he became one of the most acclaimed conductors of his generation and left behind a body of recordings that are still admired. Fricsay studied at the Budapest Academy of Music under both Zoltán Kodály and Béla Bartók, whose music he later championed. His first conducting appointment came in 1936, in Szeged, where he remained until 1944. His début, conducting the Budapest Opera, was in 1939 and in 1945 he was appointed the company's music director, taking the parallel appointment with the Budapest Philharmonic. At the 1947 Salzburg Festival, when conductor Otto Klemperer was forced to withdraw from conducting the premiere of Gottfried Von Einem's opera DANTONS TOD, Fricsay stepped in, receiving international accolades for a sterling performance. The next year he conducted the world premiere of Frank Martin's ZAUBERTRANK, and the year after that Carl Orff's ANTIGONE. 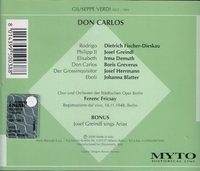 In 1948, Fricsay made his Berlin début with Verdi's DON CARLOS in a production that also featured the début of baritone Dietrich Fischer-Dieskau. Thereafter he served as a guest conductor throughout Europe, based in Berlin, where he served as music director of the Stadtische Oper and the American Sector Symphony Orchestra (RIAS), later renamed the Berlin Radio Symphony Orchestra. Fricsay was best known in Europe as an operatic conductor, acclaimed for his Mozart and Verdi, among other composers, but in America he made his début with the Boston Symphony Orchestra in 1953. He was conductor of the Houston Symphony Orchestra in 1954, but resigned after one season due to policy disagreements with the board of directors. In 1956, Fricsay became music director of the Bavarian State Opera and after two seasons, returned to Berlin to resume the music directorship of the Berlin Radio Symphony Orchestra. In 1961, Fricsay conducted a performance of Mozart's DON GIOVANNI to commemorate the re-opening of the Deutsche Oper. Fricsay's approach to conducting was influenced heavily by Toscanini, whose relationship with the NBC Symphony he used as a model for his own work with the Berlin Radio Symphony. He emphasized strict tempos and precise playing, with a close adherence to the score. As an operatic conductor, however, he was not afraid to challenge customs and conventions, both in his conception of a work and his way of realizing performances of striking vitality. Fricsay began developing serious health problems in the 1950s. The vivaciousness of his earlier performances was replaced by a more measured, reflective approach to music as his physical condition deteriorated, and by the end of the 1950s, when he would normally have been expected to be in his prime as a conductor and recording artist, his strength was beginning to fail him. When he died, Fricsay left behind a small, precious body of recordings.